This week during Innovate Celebrate, we had the opportunity to not just see the future of technology and innovation with the conclusion of our Startup of the Year competition, we also heard directly from those already making that happen. 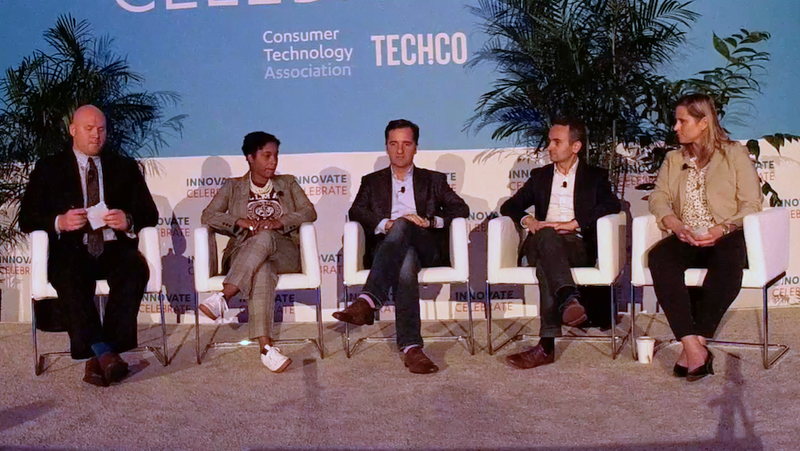 One particular panel that was filled with the likes of experts from New Balance, San Francisco 49ers, and even the U.S. Olympic Committee dug in even further by explaining how athletes were evolving due to innovation. For most consumers, we’d typically assume it was the technology that helps our athletes get the competitive edge; however, in a unanimous decision, the panel stated it was really the data that fuels it. “The wearable is the vehicle, but how it manifests itself as an experience,” said Portia Blunt, Senior Digital Sport & Wearables Innovation Manager at New Balance. For the shoe company, Blunt said that they focus on the digital athlete, someone who takes this data and integrates it into what they do, or what the panel referred to as the digital experience. Mounir Zok, the Director of Technology & Innovation for the U.S. Olympic Committee, built upon this by adding that the competitive edge found through actionable data is what allows our olympic athletes to take home the gold. Everything from coaches to information provides a constant stream of data to find that competitive edge. Mounir went on to use Michael Phelps as an example, stating that he knew that he’d be competing against teenagers, and that his training would push him hard. The technology, the data, and the information at their disposal showed Phelps how much and for how long he’d need to train to achieve that competitive edge. Talk about a successful case study. However, that technological vehicle that Blunt discussed isn’t always where the pros need it. “Are we going to wait for the market to decide what is going to be available for us to use? Or are we going to take a strategic role in the market to devise the new technology for a future reflection of what our athletes want and need? We decided to go with the second one. Technology is a part of an athlete’s life,” said Mounir. One reason for this argument is that data can be flawed, and certainly the software behind it as well. That’s exactly why Brano Perkovich, Chief Investment Officer for the San Francisco 49ers, suggested that they avoid the single point of failure. In doing so, they look at numerous sources of data, and from that they gain the best actionable insights for the 49ers and numerous coaches. “It gives me some sense of how well I train, how well I condition my players for peak performance,” said Perkovich. So how does this innovation impact the rest of us? It’s quite simple. The investments made in our top athletes often end up in the products we regularly use. From the data you get on apps like Strava and Garmin, to the wearables you have on your wrist these devices allow consumers to be competitive, too. “The data matters how it is presented to different segments,” said Blunt. That means the biggest challenge to innovation in sports and athletics is personalization.